Developing student leadership is a core aspect of the JPII & SFXP program. We do this by providing multiple and frequent opportunities for students to act and lead and therefore grow in confidence and leadership. This means spiritual leadership, too. Two recent prayer services show the growth and spiritual maturity that our student are developing. SFXP’s Shadow Stations of the Cross is a beautiful look at our Lord’s journey where students enter into the Passion with their bodies and words. 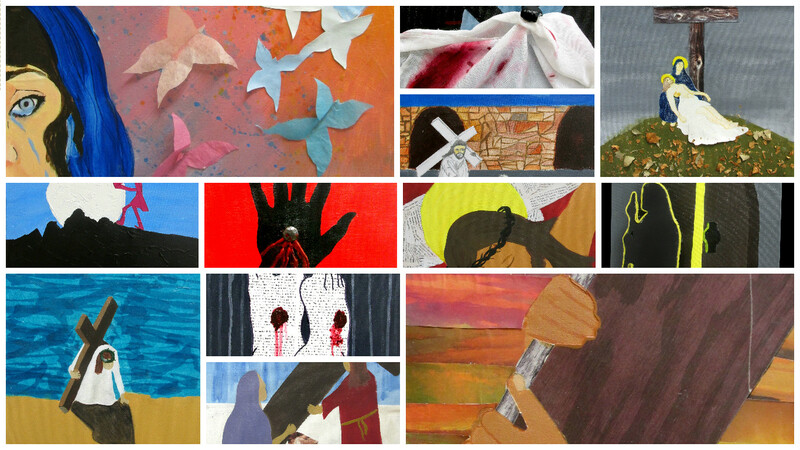 JPII’s Stations of the Cross prayer service featured student-created art (above), music, and prayer which led the school in prayer this Holy Week. This Lent our students showed the special form of leading others through following Christ. Wishing you a blessed Triduum! 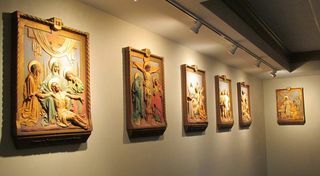 In the short history of the Our Lady of Fatima Chapel, three sets of ‘Stations of the Cross’ have adorned the walls. In our first year, a set rescued from another Diocesan entity was installed, then, nearly as quickly, taken away. Second, a generous donor and JPII family purchased stations which have held us in good stead since 2009. Now, a second JPII family has secured and repaired full-sized stations, which were installed over the weekend. Arrangements are being made for the previous stations to make their way to Ecuador. Next time you’re in the building, check ’em out. JPII families are good! Several people have asked after Dr. Francesco Cesareo’s excellent remarks at the National Honor Society Induction Ceremony last Thursday. Read Dr. Cesareo’s Address here. Good things happen, even during the (relatively) slow period of winter recess. Thanks to the generosity of the All Cape Piano Fund of the Cape Cod Foundation, JPII received a beautiful 1986 Weber upright piano donation. It's handsome, high-gloss, ebony finish and good sound will look and sound great in Our Lady of Fatima Chapel. I am most grateful to the piano's private donor, Ms. Jennifer Avalon of Centerville, and the Cape Cod Foundation for making this gift possible. On a similar note (pun intended), Ash Wednesday ushers in the penitential season of Lent. To assist the school community's focus on the Lenten season, JPII parent Mr. John Hufnagle fashioned an handsome, rugged cross which will be displayed in the auditorium lobby for the duration of the season. All of us need a visual reminder once and a while! More evidence that, brick by brick, we are building the finest high school on Cape Cod. Still glowing after an awesome Matthew Kelly presentation last night. Five Hundred(!) people packed the JPII auditorium and enjoyed words with genuine wisdom that left much to ponder. In one sentence, What did Matthew Kelly say last night? Taken together from the wealth of Matthew's presentation,I got a great look at what is important to our students. Go ahead and post your favorite Matthew Kelly line, thought, sentence or mantra from a great night! 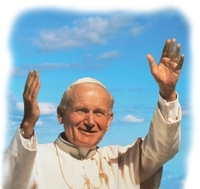 Wednesday, April 2, 2008 marked the third anniversary of the death of Pope John Paul II. We observed this occasion with remembrance and an all-school liturgy celebrated by our friend, Fr. George O’Brien. I told our students that we’re lucky; JPII’s a great guy and a great namesake. 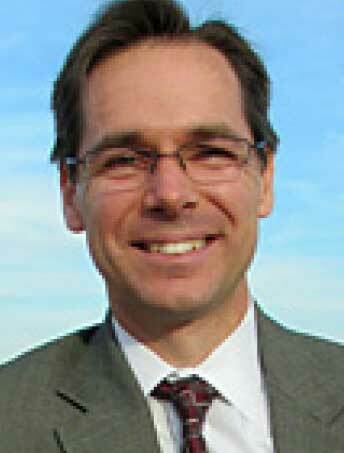 I am grateful to have the such an life and example for our school to emulate. May we always be worthy to be known as Pope John Paul II’s high school. The paradox of the cross — a tough idea to ‘get’ both intellectually and emotionally — is at the heart of our faith and central to how we can approach Holy Week. The paradox of the cross, the idea that it is in giving that we receive and that it is through dying we are born to eternal life, helps us accept the inevitable sufferings of life in a way that unites us with the life of God. I was thinking about this idea as our school prayed the Stations of the Cross (as re-formulated and prayed by Pope John Paul II in 1991) today. I watched our students struggle with mystery of Holy Week as they move from a childhood sense of Christianity into a more personal, adult, appropriated faith. Not an easy journey at all but one that is the core of our mission as a Catholic school. Watching this struggle also makes me wonder what struggles Holy Week has for me. We’re all freshmen in high school, at least in God’s eyes. Wishing all the joy of the Resurrection this Easter season! participated in a momentous event, the March for Life. to stand up for what we believe in. faith and stand up for our beliefs. That is exactly what we did. people that overflowed the basilica meant even more. speakers, and became ready to prove that we are Pro-Life Catholics. March came, I was shocked at the number of people who made the journey. Over 200,000 people marched and I was honored to be among them. It’s obvious (I hope!) that, along with college preparation, helping young people know God is our core mission. religious instruction in the classroom to be the central component. Maybe. But in my experience, not really. instruction is a necessary, but not sufficient, cause. three days as fourteen of our students joined hundreds from our Diocese and many thousands from across the nation attending the March for Life in Washington, D.C. They were remembered in prayer at school this morning. in a special way these past three days? God knows…(God does know!). We’ll find out. Our pilgrims return late tonight. school I have been involved with as student, teacher, or administrator. kid" for having only forty years of existence. is celebrated annually at the end of January. This year, a special Mass of unity will take place bringing together students and staff from all five Cape Catholic schools. On January 29, nearly one thousand students and staff from St.
a celebration of Catholic education on Cape Cod. Why wait for unity? Blog readers are welcome to attend this special event. Go to www.pjp2hs.org for more information. God’s role in helping us let go of our burdens. It sure did today. school’s life. Advent is about watching and waiting, and also working. ready and make room for Him. With this school we know about waiting and watching and working. Blessings of Peace and All Good this Advent and Christmas season!